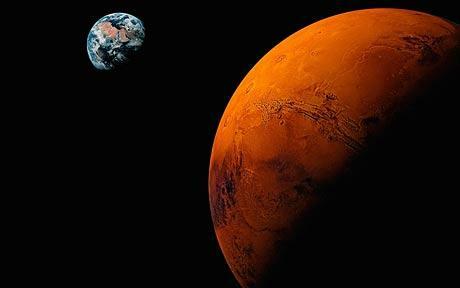 On Tuesday November 27, 2012 Mars will conjunct Pluto at approximately 8° 10′ Capricorn. Astrologically speaking, the elevated levels of conflict, turmoil and polarization occurring in recent times are related to the ongoing squares between Pluto and Uranus (in Aries). The warlike and aggressive energy of Mars combining with Pluto is likely to significantly amplify such events. In fact, if dramatic or intense events or actions were to occur this would be a likely time for them to peak in intensity (+/- 3 days, in particular). Pluto in Capricorn energizes and represents the establishment, power and authority and Mars joining Pluto brings a powerful stimulus to such affairs. This action oriented energy can be expressed creatively but it can also be expressed ruthlessly, oppressively and violently. My personal interpretation is that we might anticipate heavy handed and possibly brutal tactics to be employed by states, the military or authority figures, or that such actions will greatly intensify, around this time. This aspect (Mars conjunct Pluto) will be exact at 3:15 PM EST on Tuesday November 27, 2012 (Mars orbit is 687 days) but pay attention during the time frame of November 24-30, in particular, while Mars is within +/- 2° of Pluto. We have an intense and potentially very-fruitful month ahead! Today’s New Moon in Scorpio is setting the tone for this next lunar cycle. At this time, it’s important to delve more deeply into issues affecting our lives, as well as exploring our inner selves — to help us understand and own what we find within. 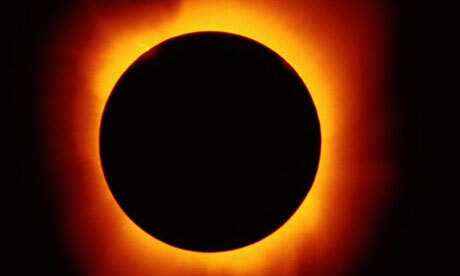 During today’s Solar Eclipse, the Scorpio Moon casts a shadow on the Earth. Old emotional patterns may surface — to be acknowledged and welcomed — as they make themselves known. In these ways, we can learn where to focus our healing energies. Molly’s Astrology is a good Astrology site where Molly suggests making two lists within this next month. Between this New Moon, today, and the next Full Moon, she recommends we make a Solar Eclipse List to claim what we intend for our lives in our near and upcoming future. Then, between the Full Moon and the next New Moon, she suggests making a Lunar Eclipse List to determine what we want to let go of —to allow our best futures to unfold. These are wonderful ways to tap and use the current potent energies. Meanwhile, Saturn, ruler of Capricorn, is moving through Scorpio for the next couple of years. Saturn is associated with structures of all kinds, both personal and societal. Introspection can yield new awareness of old and current personal issues. We’re in a cycle where it’s very helpful to investigate by looking within — seeing how strong structures remain steady, and how weak structures may collapse and make way for more sustainable structures – more aligned to our real needs. This is further amplified by Pluto, ruler of Scorpio, moving through Capricorn. Over the next several years, Pluto and Saturn are in “mutual reception” – moving through each other’s Signs. This Pluto-Saturn mutuality will continue to assist everyone with co-supportive energies for evolving sustainable changes in our lives. It’s really important to stay grounded and steady during these times. There are many ways to do this. I find being out of doors is very grounding for me. I also have certain special rocks I’ve collected over the years. Holding them in my hands seems to steady me. Think of ways to help yourselves — a piece of beautiful music, a time to sit quietly. These and similar activities may also work for you. Staying steady will serve ourselves and everyone we encounter personally and professionally — helping them to also stay steady if they’re feeling shaky or ungrounded. Calmness ripples outward. Meanwhile, Uranus in Aries is in tense relationship with Pluto in Capricorn. Uranus breaks down whatever weaknesses there are in structures, especially societal structures. Uranus is also the energy of breaking though limiting belief systems. Suddenly things are different, perhaps even unrecognizable from before. Uranus in Aries opens ways of transforming old patterns into unanticipated and even very welcome innovative solutions! As well, Mercury is still moving Retrograde until November 26, when it turns forward again. This is an excellent time for reflection, review and reconsideration! These are the times prophesized by Elders of many traditions including Maya, Hopi, Hindu, and Algonquin. They reminded us that we always have a choice — to take the low road of expediency and selfishness or to take the high road of caring, responsibility and commitment. We are at a pivotal time in history where our choices will dramatically shape our future. Please feel free to ask me any questions you may have and certainly you can share this email with others. Today, on American Election Day – Mercury turns retrograde – and will move forward again on November 26. For those of you not familiar with this term – retrograde means a Planet appears to go backwards by slowing down relative to the Earth. Mercury has three cycles each year for about three weeks at a time when it goes retrograde. Today, it is “still” while the retrograde cycle begins. 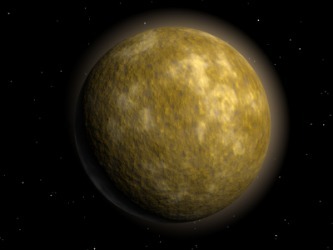 Mercury is the planet, associated with communication, transportation and technology. When it goes retrograde, all kinds of glitches can occur with our computers, and our cell phones, with appointments that are cancelled or delayed, and with travel plans. It is highly recommended to put off – until the retrograde period passes – signing any legally binding contracts or agreements. If you must sign anything during this period, please pay extra attention to the details and/or have a friend or colleague check things over. The upside of this transit is that during this period it’s a good time to slow down and re-evaluate previous decisions and actions. Its timely to review previous work or plans, and/or to reconsider certain past agreements and renegotiate. It’s key that we are patient with ourselves and others and take time to be quiet and mull things over before becoming reactive. This is the first time in US history that Mercury begins its retrograde period today – exactly on the US Election Day. In the Bush-Gore campaign of 2000 – Mercury was turning direct on voting day – standing “still” – bringing the necessity of recounting the votes and not coming up with a clean “victory”. Everyone’s vote is critical this time – for a clear result. At this same time there’s a favorable relationship between Mercury and Uranus, which can be very mentally stimulating. Ingenuity is the theme for the next few days – brilliant problem solving, quick intelligent responsiveness, and a heightened sense of intuitive knowing. I’ve also written about the ongoing tension between two major planets, Uranus and Pluto – between June 2011 and March 2015. Uranus is the Planet associate with breakthroughs and breakdowns. Its energies are unpredictable and can be exciting and rewarding or upsetting and disturbing – especially now – when it’s in the fiery sign of Aries. Pluto, in the earth sign of Capricorn, delves into foundational issues. If a foundation is weak – it will fall apart – and it can also bring breakthroughs – allowing for unexpectedly new and exciting directions and solutions to appear. We’re all experiencing this pattern in our personal lives as well as collectively – with collapsing democracies, banking systems, political systems, and more. Where it becomes “up close and personal” is when this square affects our birth planets – so if you’re born, for example, in the early degrees of Aries, Cancer, Libra or Capricorn - you may have sudden changes in your direction – at work, with personal relationships, and with setting priorities. Also if your Moon is in the early degrees of those 4 astrological Signs – you may be finding it imperative to free yourselves from previous limiting conditions, belief systems and emotional patterns, and be more authentically who you are. Right now Venus is in harmony with Jupiter until November 12. This is a very beneficial time for relationships, travel and attracting resources. So many people have opened their hearts and wallets and homes by taking actions to help the victims of Hurricane Sandy. We can all be benefitting from this period to reach out to friends and loved ones and to extend our generosity to others who need it in our communities wherever we live. We are blessed with so much abundance in a world of severe lack – let’s share it with others – benefitting them and ourselves in the process.